Quality is the hallmark of our company, in order to maintain quality standards we offer comprehensive range of Diamond Polki Jadau Necklace. Our product is highly recommended amongst the customers. 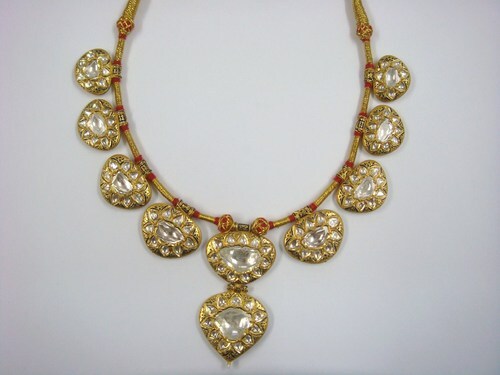 We offer smooth edges and elegant designs of Diamond Polki Jadau Necklace. One can wear them in festivals, parties and many more occasions. Ours is a father and son owned business established in the year 2000 but we are in the jewellery manufacturing business for last 4 generations. My great grandfather moved from Patna (Bihar) in the year 1903 and started the business here. My father is into manufacturing of very high quality Mugal (Kundan Meena) Jewellery. Few of the pieces made by him are in some museums. Generations of manufacturing skills have polished our sense of jewellery anatomy and our ability to create modern and replicas of old Indian, Russian and Victorian jewelry. Now after adopting modern technologically advanced infrastructural facilities we can make the best of products in very affordable prices. Our industrial set up helps in completing orders of large quantities on time. Over and above our teams of expert eyes keep the quality control to the international standards. We manufacture all kinds of high end Kundan Jewellery and Victorian Jewelry Replicas, Pave Diamond Ball Beads, Clasps and Roundels and other accessory with pave diamonds and precious stones. We want enquiries from USA, Holland, Denmark, Brazil, Argentina, Canada, Lebnan, Ukrain.